Bohol is one of the loveliest islands in southern Philippines. It is situated at the heart of Visayas and with coastline skimmed by gentle coves and white-sand beaches. Many highways snake along sparkling beaches or leafy rivers where one can stop at any point and jump in. With its rolling hills and plateaus, crystal springs and beaches, the province of Bohol is a picturesque province replete with ancestral homes and centuries-old churches. Bohol is composed of numerous isles – Panglao, Pamilacan, Cabilao, Jao, Mahanay and Lapinin, which are excellent dive spots. 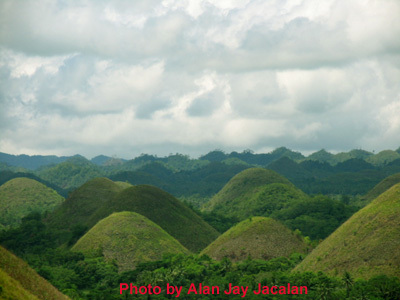 The Chocolate Hills is but one of the many natural wonders to be found in Bohol. The province is the home of the world's smallest monkey, the tarsier. The size of a fist, the tarsier lives on the hills of Corella, some ten kilometers from Tagbilaran. Other exotic flora and fauna may also be found amongst the forest of Bohol. Bohol's various mountainous and water formations also serve as a natural playground for the adventurous tourist. One can cruise its rivers, hike up the hills, swim the deep waters, or just stroll down the avenues. Bohol is just waiting to surprise you. Tagbilaran, Bohol's capital town can be reached by plane or boat from Cebu and Manila. Numerous tourist inns and excellent resorts are found in Tagbilaran and Panglao island.